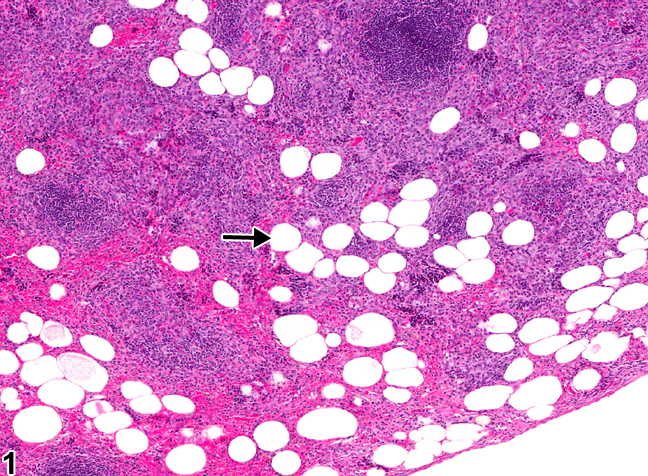 Spleen - Adipocyte metaplasia in a female F344/N rat from a chronic study. Well-differentiated adipocytes (arrow) are present multifocally within the splenic red pulp. Spleen - Adipocyte metaplasia in a female F344/N rat from a chronic study (higher magnification of Figure 1). Adipocytes (arrow) are surrounded by a fibrous stroma (arrowhead). Adipocytes are occasionally seen in the spleen in chronic toxicity/carcinogenicity studies but may be unrelated to treatment. It has been reported in the red pulp of rats exposed to some aromatic amines (e.g., aniline, aniline hydrochloride, para-chloroaniline) and in rats with splenic mesenchymal neoplasms. 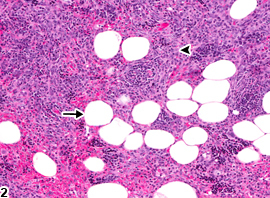 This lesion is characterized by well-differentiated adipocytes in the red pulp ( Figure 1 and Figure 2 , arrows), surrounded by a fibrous stroma ( Figure 2 , arrowhead), although fibrosis may not always be prominent. The red pulp is typically involved, and the lesion may be focal, nodular, and/or diffuse. These cells most likely arise by metaplasia of splenic stromal cells. Previous terms include "lipidosis," "fatty infiltration," "fatty metamorphosis," and "lipid metaplasia" of the spleen. Whenever present, adipocyte metaplasia of the spleen should be diagnosed and assigned a severity grade. If this lesion is present concurrently or secondarily to neoplasia, it should not be recorded but should be described in the pathology narrative. Frith CH, Ward JM, Chandra M, Losco PE. 2000. Non-proliferative lesions of the hematopoietic system in rats. HL-1. In: Guides for Toxicologic Pathology. STP/ARP/AFIP, Washington, DC. Goodman DG, Ward JM, Reichardt WD. 1984. Splenic fibrosis and sarcomas in F344 rats fed diets containing aniline hydrochloride, p-chloroaniline, azobenzene, o-toluidine hydrochloride, 4,4'-sulfonyldianiline, or D&#38;C red no. 9. J Natl Cancer Inst 73:265-273. National Toxicology Program. 2003. NTP TR-505. Toxicology and Carcinogenesis Studies of Citral (Microencapsulated) (CAS No. 5392-40-5) in F344/N Rats and B6C3F1 Mice (Feed Studies). NTP, Research Triangle Park, NC.